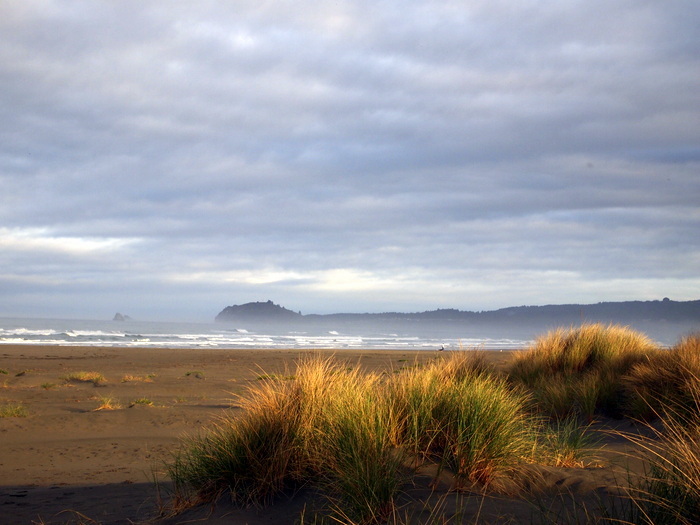 After leaving our lovely spot in the redwoods, we made a quick one night stop at Clam Beach County Park just a few miles north of Arcata. The campground was nothing special, basically just a parking lot and some sandy “sites” with picnic tables that you can park next to. It was right off highway 101 and the traffic noise was pretty constant. It also turned out to be a popular spot for travelers to use as a rest area (even though it’s not really at rest area), so there was lots of cars coming and going even at night. It wasn’t bad as an overnight stop, but not somewhere you want to stay and hangout for an extended amount of time. The beach was gorgeous though. A short walk through the dunes from the campground led to a wide open beach with nothing but sand and water for miles in either direction. 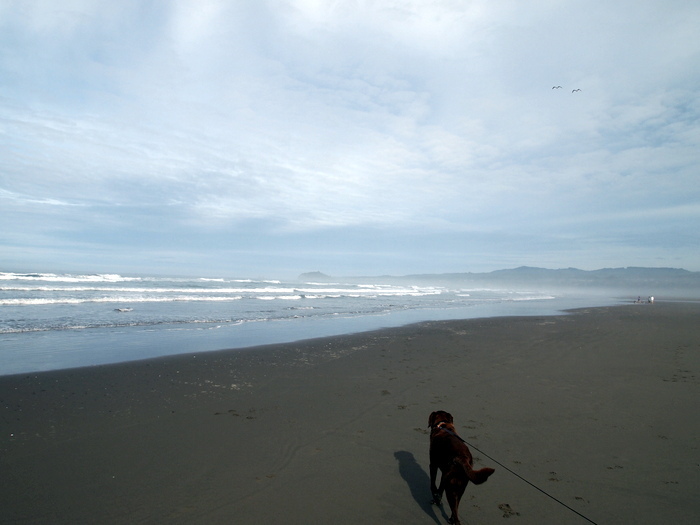 Phineas was very happy to learn that dogs are allowed on the beach, and can even be off-leash down below the high-tide mark. Clam beach is one of the few in the area to allow dogs, which means we saw lots of other pooches running around in the sand and surf. After leaving Clam beach we had a difficult time figuring out where to go next. The Arcata/Eureka area didn’t have any desirable campgrounds (we stopped at the fairgrounds in Eureka and drove right back out again). So after spending some time in the mall parking lot trying to figure out our next move we came to the conclusion that we’ll be moving through this very northern part of California a little faster than we planned. We’re not huge fans of private campgrounds, and since lots of the state parks and national forest campgrounds are closed for the year our options for places to camp are pretty limited. There seems to be more public camping options farther inland, but we’re hesitant to journey too far into the mountains due to the cold weather. I mean if we wanted snow and freezing temps in November, we’d go back to Vermont! The weather on the coast has been really nice, mid-60s during the day and mid-50s, which pretty much confirms our decision to stay on the very western edge of the state, at least for now. The lack of public campgrounds means we’ll be driving longer distances between stops, but since the scenery along the way is nice that’s not really a big deal. Besides, we’re sure this is only the first of many trips through California so we can always come back and re-visit the places we miss this year.